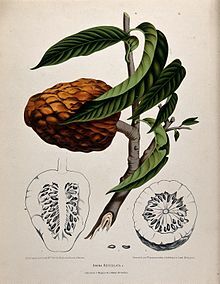 Wikisource has the text of the 1911 Encyclopædia Britannica article Custard Apple. Look up custard apple in Wiktionary, the free dictionary. Custard apple is a common name for a fruit, and the tree which bears it, Annona reticulata. The fruits vary in shape, heart-shaped, spherical, oblong or irregular. The size ranges from 7 centimetres (2.8 in) to 12 centimetres (4.7 in), depending on the cultivar. When ripe, the fruit is brown or yellowish, with red highlights and a varying degree of reticulation, depending again on the variety. The flesh varies from juicy and very aromatic to hard with a repulsive taste. The flavor is sweet and pleasant, akin to the taste of 'traditional' custard. Asimina triloba, the "pawpaw", a deciduous tree, ranging from southern Ontario to Texas and Florida, that bears the largest edible fruit native to the United States or Canada. Annona cherimola, a tree and fruit also called cherimoya. ^ "Custard Apple". Hort.purdue.edu. Retrieved 2013-11-05. ^ "Annona reticulata". Germplasm Resources Information Network (GRIN). Agricultural Research Service (ARS), United States Department of Agriculture (USDA). Retrieved 2008-04-21. ^ Mahdeem, H. (5 July 1998). "Annona reticulata". Neglected Crops. Department of Horticulture & Landscape Architecture, Purdue University. Archived from the original on 11 May 2008. Retrieved 16 April 2008. ^ "Annonaceae". Integrated Taxonomic Information System. Retrieved 18 March 2008. ^ "Annona cherimola". Germplasm Resources Information Network (GRIN). Agricultural Research Service (ARS), United States Department of Agriculture (USDA). Retrieved 2008-04-21. ^ "Annona squamosa". Germplasm Resources Information Network (GRIN). Agricultural Research Service (ARS), United States Department of Agriculture (USDA). Retrieved 2008-04-21. ^ "Annona senegalensis". Germplasm Resources Information Network (GRIN). Agricultural Research Service (ARS), United States Department of Agriculture (USDA). Retrieved 2008-04-21. This page was last edited on 18 January 2019, at 06:17 (UTC).